Sir Anthony Habgood (centre) receives his award. 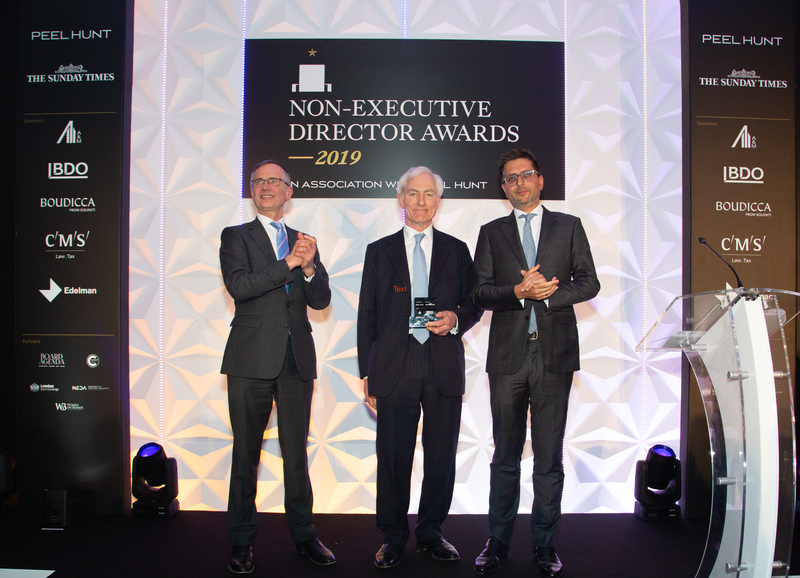 Sir Anthony Habgood has been named FTSE 100 Non-Executive Director of the Year at an awards ceremony in London. He was joined by Dianne Walker, a non-executive at BAKO North Western group, who won the Dame Helen Alexander NED to Watch Award. Sir Roger Carr, chair at BAE Systems and a former chair at Cadbury and Centrica, took the Lifetime Achievement Award. 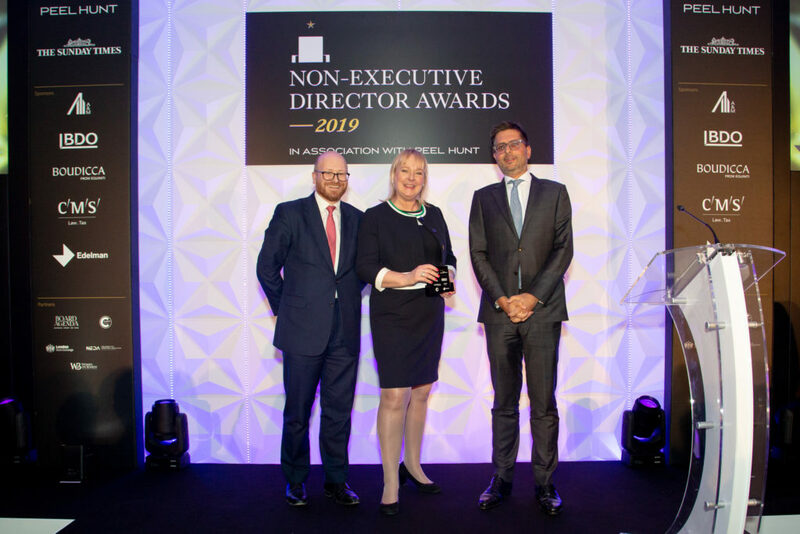 Launched in 2006 by Peel Hunt, the Non-Executive Director Awards were created to recognise the achievements of non-execs who contribute to the success of business and businesses across the country. Paul Drechsler, president of the CBI and chair of this year’s judging panel, told Board Agenda: “The value and importance of these awards is to bring clarity, transparency and awareness to what excellence looks like, as determined by a diverse group of judges. Sir Anthony is the current chair of RELX Group, the business analytics provider, and Preqin, the data providers for investors. He is also chair of the Court of the Bank of England. He has previously served as CEO of Bunzl and chair of Whitbread. The Financial Times has described Sir Anthony as the “go-to grandee”. He led a distinguished shortlist that included Andrew Higginson of Wm Morrison Supermarkets, Naguib Kheraj of Standard Chartered Bank, Ian Marchant of John Wood Group and Deanna Oppenheimer of Tesco. Dianne Walker, winner, NED to Watch Award. Dianne Walker has been with BAKO since 2016 but also serves as a non-executive with Scott Bader, the chemicals company, where she serves as chair of the audit committee. Sir Roger Carr has been described as “one of the most sought after non-executives and chairmen in the City”. As well as his many high-profile chair positions, Sir Roger has also served as president of the CBI and is former chief executive of Williams Holdings, which later demerged to become Chubb and Kidde. Other award winners included Philip Aiken of AVEVA Group who took top honours among FTSE All Share non-executive, while Richard Last, of Gamma Communications, took the prize for non-executives from FTSE AIM. Victoria Raffe, of Starling Bank, took the award for Private/Private Equity Backed Non-Executive. Tony Cohen of Barnardo’s received the award in the Not For Profit/Public Service Organisation category. The Hong Kong Stock Exchange has proposed allowing widely criticised dual class shares in changes to listing rules aimed at attracting China's big tech companies. Alibaba founder Jack Ma has revealed plans for succession, the culmination of decade-long preparation. How can other companies follow his example?